The First Alert Tundra Fire Extinguishing Aerosol Spray is easier to use than traditional fire extinguishers. It discharges four times longer than regular extinguishers, making it ideal for fighting common household fires and allowing you to ensure the fire is completely out. The nozzle sprays a wide area, giving you greater control to put out a fire faster. Just point and spray the Fire Extinguishing Aerosol Spray on household fires involving paper, fabric, wood, cooking oils, electrical appliances, and equipment. The portable extinguisher spray is ideal for the kitchen, boats, RVs, and travel. The biodegradable formula of this foam fire extinguisher spray wipes away with a damp cloth for easy cleanup. 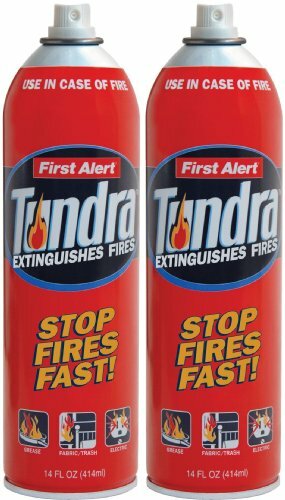 Tundra Fire Extinguishing Spray is 4x greater discharge time vs. traditional fire extinguishers. Tundra Fire Extinguishing Spray is easy to use aerosol can and spray nozzle design is intuitive to use. Tundra Fire Extinguishing Spray offers easy cleanup - simply wipe it away with a damp cloth. It is biodegradable.